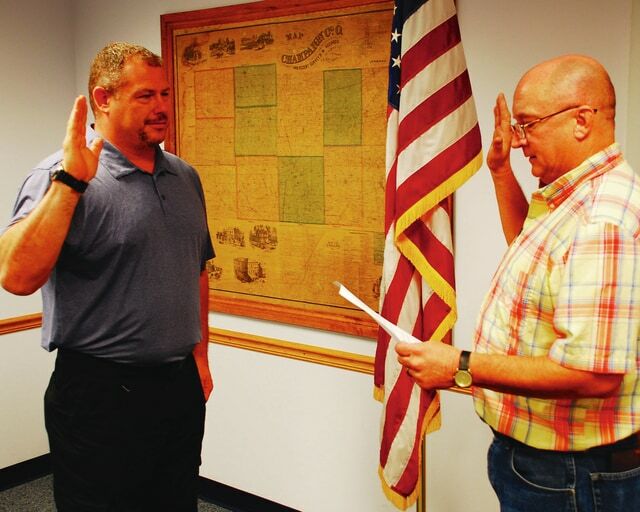 Champaign County Emergency Management Agency Assistant Director Kip Michael, left, is sworn in as the new county EMA director June 24 by director Craig Evans. Evans’ retirement went into effect June 26. Champaign County Emergency Management Agency director Craig Evans retired from his position June 26 after 11 years as the agency’s director. The retirement comes after decades of service to the community. It started at the Urbana Fire Division. Evans said he always wanted to be a firefighter and his interest grew while serving in the Navy for four years. After working as one of the first 500 employees hired at Honda’s Marysville motorcycle plant, Evans was hired by the Urbana Fire Division on his birthday in 1983. In 1991, he was promoted to fire captain, a position he held until he retired in 2000. During his tenure with the Urbana Fire Division, Evans was a training officer for the department and started a business in which he provided emergency response and management training for multiple businesses. He said this experience helped him understand the process of emergency management and the multiple stakeholders involved in a large event. Evans started in the EMA as a volunteer in December 2000 under former Urbana fire chief Eugene Branstiter, who had retired from the fire department and was the chief of the EMA at the time. Urbana Fire Chief Mark Keller, who replaced Evans as a fire captain, worked closely with Evans for a number of years in the Urbana Fire Division. Keller said through the leadership of Branstiter and Evans, the EMA has helped local entities come together and handle different incidents including hazmat, flooding and tornadoes. Keller said Evans was one of the founding members of the county’s hazmat team and brought hazardous material training to the community. Evans said the EMA director looks at four phases of emergency management including mitigation, response, planning and recovery. Following 9/11, Evans said, Homeland Security funding started to flow in and he was hired as a part-time employee in December 2001. When Branstiter stepped away from the director position, Evans was recommended and hired as the director in 2004. Some of the major events that took place during Evans’ tenure as EMA director included major snow and ice storms in late 2004 and early 2005, flooding in the northwest area of Urbana in 2008, high winds from Hurricane Ike in 2008 and severe wind and storms in June 2012. A major accomplishment Evans said he is proud of is the consolidation of dispatch centers to form the Champaign County Public Safety Communications Center, or 911 center, which opened in 2006. Evans said the project was a team effort of elected officials and first responder chiefs. Vannessa Haley, 911 center director, said Evans has been a crusader for making sure the center succeeds. Haley has been the 911 director almost two years and said Evans was key in helping her transition into the position in 2013 while the center was seeking an operating levy. Now in retirement, Evans said his next career is being a small business owner operating Champaign Fire Equipment, LLC, 200 Park Ave. In addition to selling hand-held fire extinguishers, Evans said he can help people discuss fire exit plans or strategies for finding shelter during a tornado. Taking over for Evans is former Urbana police officer Kip Michael, who has job shadowed as the assistant EMA director since December. Michael worked for the Urbana Police Division from October 1991 until retiring last November. He said the opportunity came when he felt it was time to make a transition. Urbana Police Chief Matt Lingrell has worked closely with both men. He described Michael as a kind and caring officer during his time with the department. In addition to his experience with the Urbana Police Division, Michael was an active and reserve soldier in the Air Force. When he was deployed to Iraq, Michael was a superintendent of training and logistics, a role that Evans said will help as the EMA director in situations where managing logistics and supplies are important. Michael said the information he received from Evans while job shadowing has been invaluable. While Michael was taking introductory courses as part of the promotion, Evans was able to keep the agency’s normal business hours. Throughout his tenure as the EMA director, Evans said, he was fortunate to have an executive board that listened to him and supported him. He also credits the board for allowing Michael to job shadow him since late last year to allow for a seamless transition.